Congratulations to the KHS Science Olympiad team. They placed 6th this past weekend at the Mentor Regional Invitational, missing a state bid by 11 points. Many individual awards were noted, including: Mac and Nathan Snyder-6th in Wright Stuff; Andrew Lauer, Jessie Kirschman, and Nya Ku-5th in Codebusters; Andrew Lauer and Hannah Yakovac-3rd in Herpetology; Nya Ku and Amelia Witmer-Rich-6th in Water Quality; Jessie Kirschman and Tyler Larkin-5th in Write It, Do It; and Mac Snyder and Robert Sunderhaft-6th in Mission Possible. Best wishes to the KMS team that will be competing at Ohio State in April. Kenston Invitational Registration is now closed! Science Olympiad will begin meeting next week. Drop in room B131 on Tuesday or Wednesday from 2:30 to 3:30 PM or Tuesday or Thursday from 6:45 to 8:45 PM. If you did not join the Google Classroom, see posters for the code. If you are in the classroom, please fill out the survey. Lastly, forms were passed out at the parent meeting and are posted in classroom. Forms are due to Coach Wilk by October 5th. Do you like to build things? Figure out how things work? Do you like thinking outside of the box? Science Olympiad might just be for you. An informational meeting will be held during homeroom on Monday, 9/17. Join Coach Wilk and former team members in Room B131. Please stop into your homeroom to let your teacher know you will be attending. A list of attendees will be provided to all staff at the end of the meeting. Please join Coach Wilk and Coach Koscics as they outline the 2018-2019 Science Olympiad Season. Bring calendars to check dates for invitationals, regionals, and states. Informational will go out during the student meeting and will need to be returned at the parent meeting. Please contact the coaches at khs.so@kenstonapps.org with questions. A hearty congratulations goes out to the Kenston High School Science Olympiad team who edged out Mayfield this weekend in Regional Competition, earning a spot at the State Finals at OSU in April. The following KHS students placed in their respective events. Congratulations goes out the the KHS Science Olympiad team. In a field of 66 schools, coming from as far away as Wisconsin, Kentucky, Michigan, and Pennsylvania, as well as locally, the team placed 29th out of 66. The team continues to work hard in preparation for the upcoming Mentor Invitational and Regionals later this month. Please congratulate the KMS Science Olympiad teams for placing 13th and 31th out of a field of 46 teams at the Solon Invitational on Saturday. The following Freshmen students received awards in their respective events. Science Olympiad braved the subzero temperatures to compete at the Westlake Invitational this past Saturday. Betsy Ortner and Emma Gross brought home some bling, medaling in 3rd place for Ecology. The team, as a whole finished in the middle of the pack out of 53. The dedication, positive attitudes, and support for each other and the middle school team made the day even better! This weekend has us on our home turf for the KENSTON INVITATIONAL. Science Olympiad will be having this year’s kick-off meeting on Wednesday, September 27th. Parents and students are invited to attend. Join us in room B131 from 7-8 pm, where Coach Wilk will outline the upcoming season. Kenston High School and Kenston Middle School Science Olympiad teams will compete for a spot on the states roster. The top 6 teams from the northeast Ohio high schools and middle schools will proceed to states. Wish the Kenston High school and Middle school Science Olympiad teams good luck for this Saturday’s regional tournament at Case Western University. 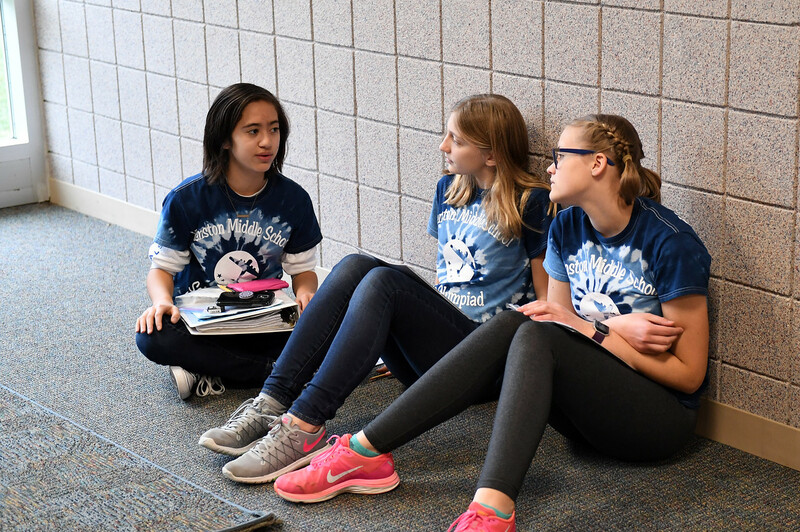 On Saturday, 76 teams and 1,200 students with 500 coaches and parents invaded Kenston for the 9th annual Kenston Science Olympiad Invitational Tournament. Congratulations to the C Division Kenston Science Olympiad Team for finishing 11th place overall. The following participants earned awards: 1st place in Optics – Fred Fikter & Ryan Sauder; 3rd place in Ecology- Evan Frank & Betsy Ortner; 8th place in Rocks & Minerals- Betsy Ortner & Kevin Edwards. In Division C, 27 Teams participated we fielded 2 teams (one of them a partial team). Overall we achieved 13th and 15th places. Twelve for Twelve: KHS qualifies for States! Thank you for registering! Registration is now closed.